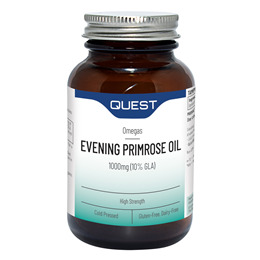 Quest Evening Primrose Oil has a guaranteed 1000mg of gamma-linolenic acid or GLA (Omega 6) in each capsule. A dose of 3-4g of Evening Primrose Oil is suggested to support women`s health and skin health. Why use Quest Evening Primrose Oil? Rich source of essential omega 6 fatty acids. An intake of 3000mg daily has been found to promote menstrual health. Guaranteed 100mg GLA (10%) in each capsule. Evening primrose oil extracted by a solvent-free extraction method. Natural vitamin E as an antioxidant. Evening Primrose Oil (providing 10% GLA), Capsule Shell (Gelatin, Glycerin), Vitamin E (Natural source Vitamin E from Non-GM Soya). Take one to three capsules daily with food. Swallow with water. Below are reviews of Evening Primrose Oil Omega 6 - 90 x 1000mg Capsules by bodykind customers. If you have tried this product we'd love to hear what you think so please leave a review. Excellent product. It really helped me. Takes a few months before you feel a difference but worth persevering. 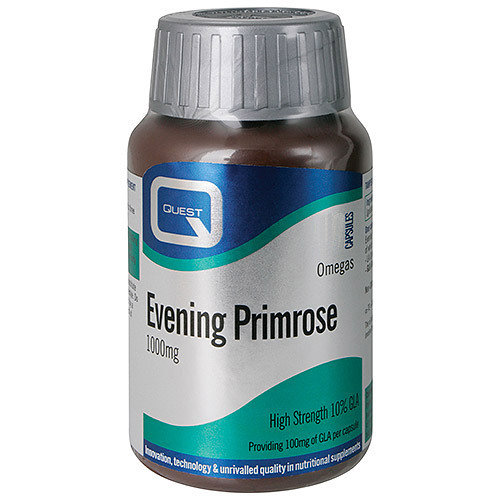 Quest Evening Primrose Oil has a guaranteed 1000mg of gamma linolenic acid (Omega 6) in each capsule. An intake of 3000mg daily has been found to promote menstrual health.